LO3 Energy and European electricity exchange EPEX Spot plan to develop blockchain energy trading and transaction systems to link microgrids with the European wholesale power market. Staging an international launch event in Paris this week, EPEX Spot and New York-based LO3 Energy signed a memorandum of understanding to share their expertise. 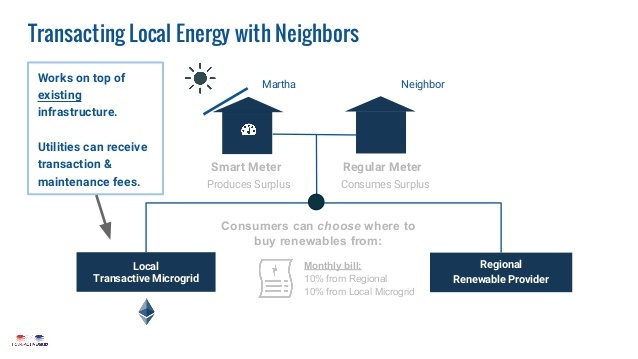 LO3’s technology will initially be used in community microgrids to connect local, peer-to-peer markets with EPEX Spot wholesale markets. The partners will focus on the United Kingdom and central and western Europe, where EPEX Spot operates. LO3 Energy is currently developing microgrids in the southern German town of Landau and the Allgäu region. EPEX and LO3’s first joint pilot project will also be located in these areas, said Wolfram Vogel, EPEX Spot director of public and regulatory affairs. The partners will focus their blockchain microgrid concept at locations where flexibility, demand response and grid congestion management will best integrate with local and regional utility grids, Vogel told Microgrid Knowledge. EPEX Spot and LO3 Energy first will design a proof-of-concept community microgrid blockchain platform. Then, using lessons learned, the partners will tackle specific pilot projects. 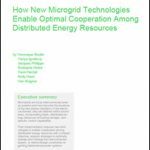 “The establishment of a connection between a first microgrid and the wholesale market will depend on the implementation of the microgrids, which are still ongoing. As soon as these processes are completed, we can make a more precise estimation of the overall timeline,” Vogel said. Prosumers, i.e. businesses and households that produce as well as consume electricity, stand to benefit from the arrangement because it will allow them to sell surplus power to a much wider array of buyers, according to the companies. They also will gain greater market price discovery and transparency. For example, prosumers can feed excess electricity from their solar panels into the grid, and consumers can satisfy shortfalls at market prices and optimize their energy consumption using batteries. All market participants benefit from market reference prices and exchange services, and from further market opportunities involving clean energy, according to the companies. Utilities and energy services companies are facing unprecedented challenges amid the shift to decentralized, digital, and cleaner energy infrastructure and markets. The partnership aims to transform these challenges into advantages. “This is a unique opportunity to engage customers from the retail level that have been isolated to a large extent from power markets,” Vogel said. “As a forerunner in market coupling and as a major contributor to the establishment of the Internal Energy market in Europe, EPEX SPOT has always been driven by visions, and this project is visionary just as much as it is concrete, which is very motivating,” Vogel said. LO3 Energy has been casting its business development net far and wide since building a blockchain solar-storage microgrid in a Brooklyn neighborhood. That project uses LO3’s Exergy digital peer-to-peer energy trading system. The startup last year announced that Siemens’ venture capital arm was taking an equity stake in the company and that it would work with Siemens Digital Grid to integrate Exergy with Siemens’ microgrid controller. In October, LO3 Energy established a presence in Australia, and earlier this month, the company joined with the Karlsruhe Institute of Technology and energy providers EnergieSudwest and Allgauer Uberlandwerk to roll out peer-to-peer microgrid trading systems throughout Germany. “Running on Exergy, this partnership will represent one of the most disruptive applications of technologies in the power markets,” said LO3 Energy founder and CEO Lawrence Orsini. 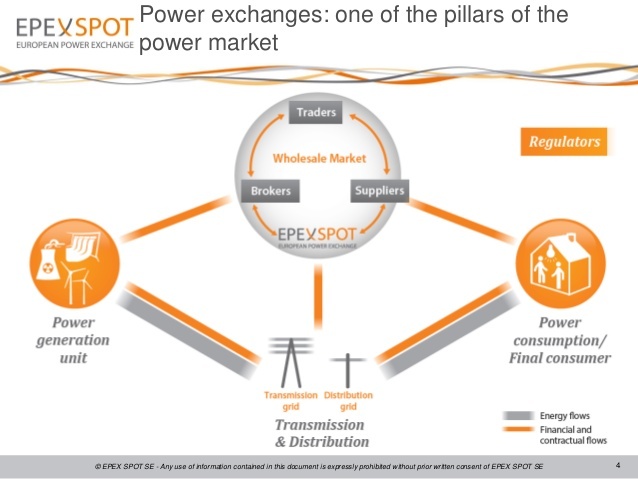 EPEX Spot (the European Power Exchange) and its affiliates operate electronic exchanges that enable wholesale power and energy participants to trade power on a short-term, spot market basis. Its 278 members traded 529 terawatt-hours (TWh) of power in 2016, according to the exchange organization. EPEX Spot’s member base spans eight European nations. Nearly half (49 percent) of the exchange’s equity is owned by HGRT, a holding company comprised of transmission system operators. “This partnership will make possible the first concrete realization around blockchain for EPEX SPOT. The Power Exchange has been following very closely the evolution of this technology and what is the added value that can be gained by the energy community,” Vogel told Microgrid Knowledge. Use of blockchain has been limited on the wholesale market, which in Europe relies on complex algorithms that take into account flows and available capacities beyond national borders. LO3’s transactive grid overcomes these limits and is complementary to EPEX Spot’s wholesale market systems platform as a result, according to Vogel. “Use of blockchain and decentralized ledger and transactions is particularly meaningful on the micro-local level where the amount of small transactions might be significant and where the current model finds its limits,” Vogel said. An initiative to build a pan-European energy exchange and distributed energy trading network is under way in the European Union. EPEX Spot is working along those same lines. Blockchain distributed energy trading systems that connect prosumers to local and wholesale energy markets ​may do so more effectively​ than existing technologies. Whether or not that proves to be the case, or unforeseen problems or issues arise, remains to be seen. What might the future hold for blockchain and microgrids in wholesale power markets? Share your thoughts below or on our LinkedIn Group. Lo3 moving at lightening speed. Definetly the future!